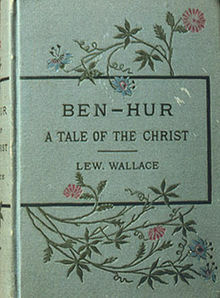 Ben-Hur: A Tale of the Christ is an historical novel by Lew Wallace. It was published on November 12, 1880 by Harper & Brothers. The novel was the first work of fiction to receive a blessing from a pope. This happened during the reign of Pope Leo XIII. The novel is set in Ancient Rome and Ancient Judea. It tells the story of two men - one a Jewish prince (Ben-Hur) and the other a Roman tribune - whose lifelong friendship turns to bitter hatred. At the end, Ben-Hur witnesses the crucifixion of Jesus. He becomes a Christian. The book was the best-selling American novel from the time of its publication until Gone with the Wind appeared in 1936. Following the 1959 release of the movie Ben-Hur starring Charlton Heston and Stephen Boyd, sales of the novel soared, topping those of Gone with the Wind. ↑ Asimov, Isaac. Isaac Asimov's Book of Facts, New York: Random House Publishing, 1981. ↑ Dollison, John. 1994. Pope-Pourri: What You Don't Remember From Catholic School. Simon and Schuster, p. 200. ↑ Christian Work and the Evangelist: 1903, Volume 74, Issues 1881-1897, p. 895. This page was last changed on 11 August 2018, at 20:47.